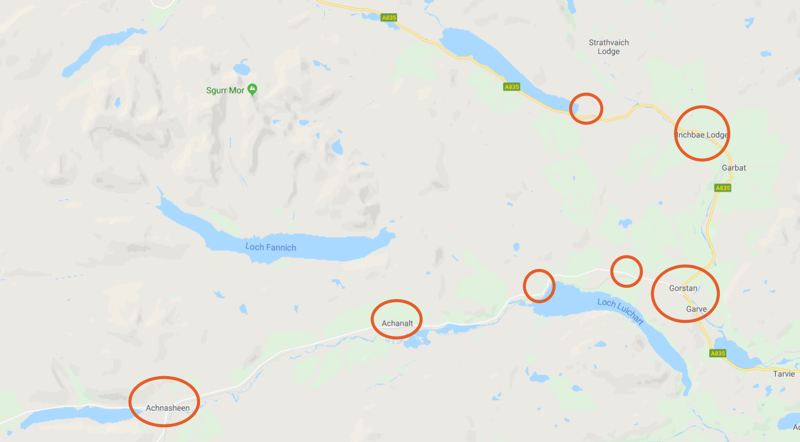 A mix of community digging, public subsidy and private investment is set to be used to help build Openreach’s (BT) Gigabit capable Fibre-to-the-Premises (FTTP) “ultrafast broadband” ISP network to reach 140 homes, which exist across several of the most remote rural Highlands communities in Ross-shire (Scotland). The communities, many of which would currently struggle to receive a fixed line broadband speed of much above 0.5Mbps (Megabits per second), are all sparsely scattered across 26 miles of rugged terrain and include Achnasheen, Achanalt, Lochluichart, Corriemoillie, Little Garve, Gorstan, Grudie, Inchbae and Aultguish. Funding for the work is set to come from a mix of sources including the Lochluichart Community Trust (i.e. an investment of benefits collected via the local wind farm), the UK Government’s Better Broadband Subsidy Scheme (connection vouchers) and the £428m Digital Scotland (DSSB) project with Openreach. Roughly a third of the deployment (more than 35% of the properties) will also involve one of Openreach’s co-funded Community Fibre Partnerships, with local residents agreeing to organise the digging for the final few metres of cable from the fibre ‘spine’. The project appears to stem from a year of research by the voluntary Garve and District Broadband (GDB) group, which looked at all the options and eventually pushed for FTTP. The group was previously only able to support a satellite subsidy scheme (since May 2015). “It’s a tremendously exciting time. Like many residents I’ve only been getting very slow speeds capped at 0.5Mbps, making even the most basic of online activities difficult and frustrating, so looking forward to ultrafast speeds is fantastic. Fast, reliable broadband will bring huge potential to regenerate our scattered communities. It’s a prerequisite for attracting families and businesses to the area, where the population has fallen in recent years. People now expect good internet as a basic. In essence, it will help us to build a closer and more integrated community. 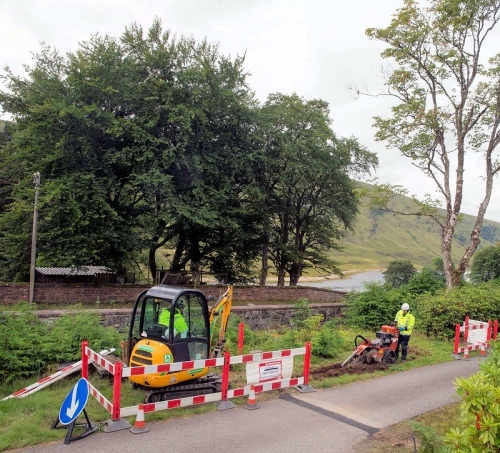 The new network started to go live this week, with around 90% of premises in Achnasheen already able to order a service (the picture attached to this article shows Openreach’s engineers laying the armoured cable just outside of Achnasheen). Apparently the aim is to complete the whole deployment by the end of 2018. “The challenges facing the Garve and District communities were phenomenal and they’ve worked incredibly hard to develop a unique solution. 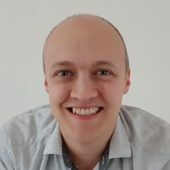 With a collaborative, multi-partner approach and a fierce will among the community to dig in and deliver, this is a truly brilliant – and unique – example of what can be achieved. Today’s news follows hot on the heels of the recent announcement that 25,000 additional premises in Scotland’s rural Highlands and Islands (H&I) region will be able to access “superfast broadband” as part of a second round of extended coverage for the region (here), which falls under the existing DSSB project. As in similar deployments there’s now a rising trend of FTTP in the later phase of such contracts. Meanwhile the Scottish Government has separately pledged £600m to bring “superfast broadband” (30Mbps+) access to all premises by 2021 via their future Reaching 100% (R100) project (here and here), which could also involve some FTTP. All of this tends to feed into the national Government’s wider aspiration to bring a full fibre network to 100% of UK premises by around 2033 (here), as well as Openreach’s own roll-out to 3 million premises by the end of 2020 and possibly 10 million by c.2025. Since BT/OR seem to have no interest in deploying FTTP to areas where G.Fast is unable to offer any better speeds than VDSL, would they also let me dig the final few (hundred) meters back to their FTTC cab, or perhaps even hire somebody suitably qualified to do it on by behalf? Fastman, that is just a BT Group way of doing things. There are many spare fibres in the fibre cable to the cabinet and many spare at the AGN. OR is perfectly capable of allocating one of more of the spare fibres in the fibre bundle for the purposes of extending the network onto the poles. You can have different rules for rural. The imposition of the AGGN node as a point of departure is a just an chosen means of introducing more cost, part of the legacy of creating complexity and more cost. Or the alternate view is that the long term plan of lots of full fibre and retiring the PCP and VDSL2 cabinets once copper is removed means it makes sense to construct the FTTP network now with the removal of those assets in mind. It seems to be BT/OR who require this for commercial reasons rather than any technical limitation that would prevent an initial batch FTTP service being delivered over G.PON using existing fibre capacity from the VDSL cab to their notional Aggregation Node.. The clue being in the name, with the AGN aggregating the fibres from the various VDSL cabs in manner which is analogous to how the VDSL cab aggregates the copper tails from the end user locations. Spare fibres are usually available at agg nodes, not at FTTC cabs which btw use p2p fibre. You can’t just connect new fibre willy nilly to the nearest fibre termination points you come across eg your nearest FTTC cab. 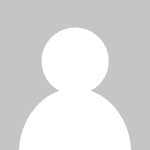 Agg nodes are there for a reason – to support future expansion of GPON networks. @spineless. Fibres laid to the FTTC cabinets will be provisioned based on the the forecast usage, growth and nearest cable capacities. OR may utilise fibres for FTTP in future but they are only likely to do this for business not consumer. In addition OR It simply does not make sense to peel of capacity to individual homes hence why FoD is expensive. Your analogy with building is flawed. If a builder builds a house away from infrastructure he has to pay for that infrastructure (roads, sewage, water etc) or await government or other to fund new neighbourhoods. Therefore if a consumer cannot wait for FTTP to be rolled on mass in their area (shared resources) then they need to pay the premium. I’m sure they would (to your nearest Agg node rather than cab) provided you lived in a remote/rural area where wayleaves or permissions wouldn’t be a huge obstacle…just like those in this article did or in the B4RN project did. Andrew is spot on. The death of copper will see a majority of exchanges and many traditional cabs eliminated. Trying to tie fttp to cabs which are often located for long gone historical reasons rather than building the fib network for the future is madness.